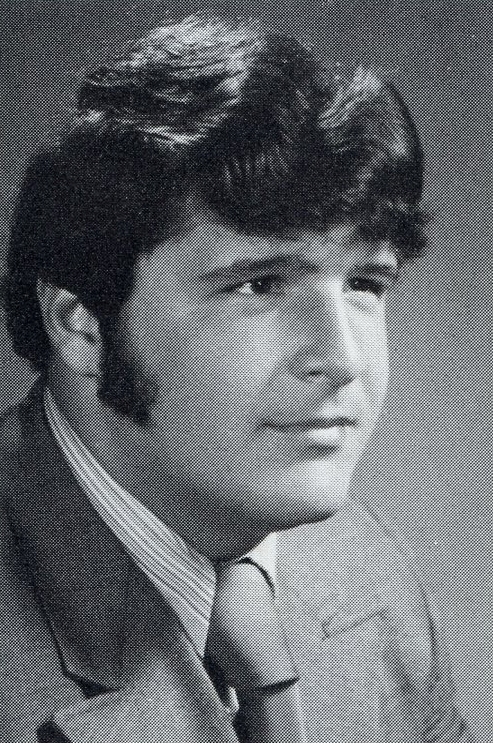 On this page, we remember and honor members of the Class of 1973 who have passed away. Three years behind us, they played an important role in enriching our experience, often as fellow members in extracurricular activities. Please click on names in blue to see the tribute. To see other tributes, hover over the "Life Tributes" link to the left and click on the page of interest. 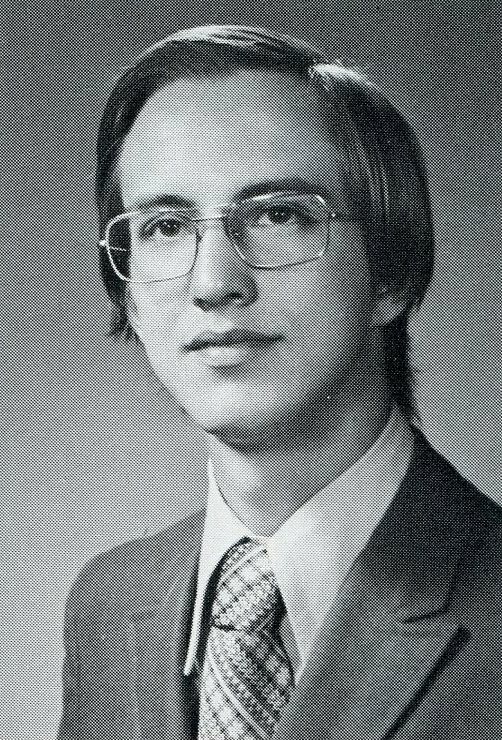 James during his junior year and later in life. James R. Banning, Jr., 65, passed away peacefully at home on Thursday, May 3, 2018, with his loving family at his side. Born Feb. 1, 1953, the son of Marjorie D. (Spaulding) and the late James R. Banning, Sr., he had been a Chicopee resident for over forty years. A graduate of East Longmeadow High School, James worked as a machinist for local companies. He was an avid fisherman and outdoor enthusiast, enjoyed gardening, and never passed up an opportunity to lighten someone's day with a joke or good-natured prank. Besides his caring mother, Marjorie D. Banning of East Longmeadow, James is survived by his beloved wife of forty-three years, Nancy J. (Czuchra) Banning; loving children Scott M. Banning and his wife, Ashley of Chicopee, and Amy M. Deacon and her husband, Matthew of Westfield; brothers Brian Banning of Monson and Bruce Banning of Longmeadow; cherished granddaughter, Savannah; and two grandsons. James' remains are interred in Saint Rose de Lima Cemetery, Chicopee, MA. A 62 year old resident of Warren, MA was killed in a car crash on Main St., Saturday, Dec. 2, 2017. Edward Stawiarz was brought to Mary Lane Hospital in Ware after the about 5 p.m. crash and was pronounced dead, Warren police said. A witness who was behind the car Stawiarz was driving, said the driver was traveling eastbound very slowly. When he approached the intersection of North and South St., the light turned red but he didn't stop. He then veered to the left, drove onto the sidewalk, up the embankment, and struck a Verizon utility box, police said. When police, firefighters, and emergency medical technicians arrived, they found the 2005 Pontiac Vibe sideways across the road and saw the driver was unresponsive. They performed CPR at the scene and rushed Stawiarz to the hospital, police said. 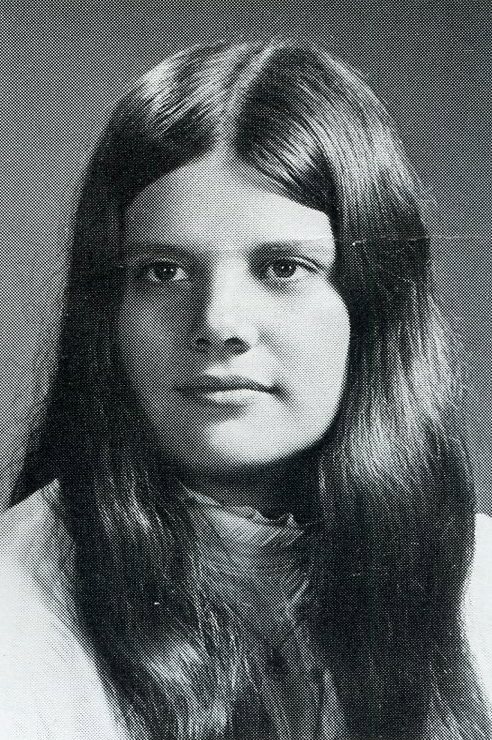 Donna in 1973 (senior photo) and later in life. Donna left this earth peacefully, at home, surrounded by loved ones on Tuesday, Aug. 22, 2017. She was born to the late Robert H. and Beverly B. (Sayward) Harwood in Virginia. 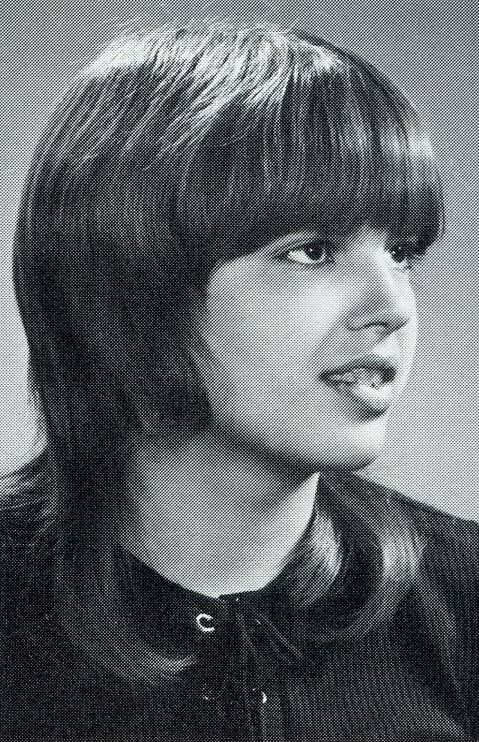 Donna graduated from East Longmeadow High School in 1973. She began her family soon after. Donna lived her life between Massachusetts and New Hampshire and always gave all she could to her kids and family. She battled cancer for 10 1/2 years and always did so with a smile. She refused to let her illness define her. She enjoyed reading, baking, spending time with grandchildren, and traveling with her true love, her husband, Mark. They were together for over 30 years. 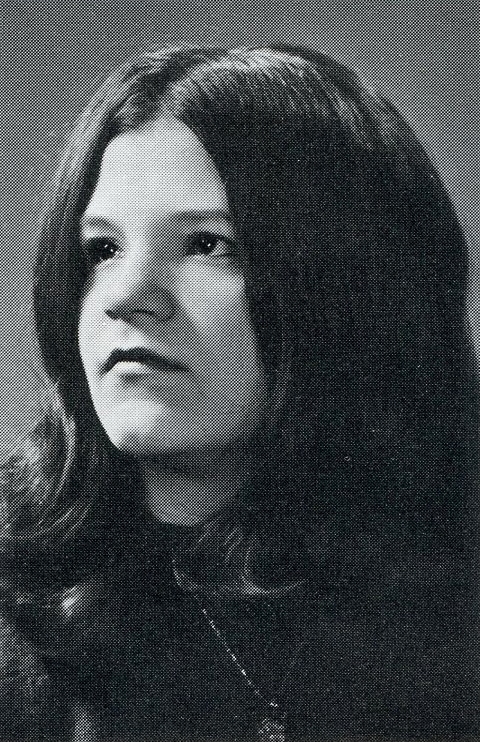 Donna was predeceased by her younger brother, Robert H. Harwood, Jr. She leaves her husband, Mark Puzzo; her daughters Penny and husband, Leo Pilares, Jaime and husband Matthew Savageau, all of Westfield, and Chelsea Puzzo of Utah; and her sons Justin Thompson of Utah, Ryan Puzzo of Florida, and Dominick Puzzo of Kentucky. She also leaves her grandchildren Jenna Pilares, Coral Savageau, Kayla Thompson, Curtis Maisey, and Ryan Puzzo, Jr.; her sister, Nancy Pride and husband, Duane; brothers David Harwood and Raymond Harwood and wife, Teri; as well as many nieces, nephews, cousins, and extended family. In lieu of flowers, memorial contributions in Donna's name may be made to the American Thyroid Association at www.thyroid.org. (Excerpted from the Wilbraham Funeral Home, Wilbraham, MA website). Linda J. Garlick, 61, a lifelong East Longmeadow resident, passed away on Sunday, Sep. 4, 2016 at Baystate Medical Center. She was born in Springfield, MA on Aug. 16, 1955, a daughter of the late Adolpho and Barbara (Hiller) Tesini. She was a graduate of East Longmeadow High School and was self-employed as a housekeeper. She is survived by her son, Andy Ralph of Agawam; three brother, Alan (Susan) Tesini of Zephyrhills, FL, Stephen (Tina) of South Hadley, and Carl (Ronda) Tesini of Idaho. She also leaves two sisters, Donna (Kenneth) Langdon of Springfield, and Karen (Joseph) Chlosta of East Longmeadow. She will also be missed by two grandchildren, Amelia Ralph and Keith Roy; and great-grandchild, Kaden Roy. She was predeceased by her son, Jeremy Garlick. 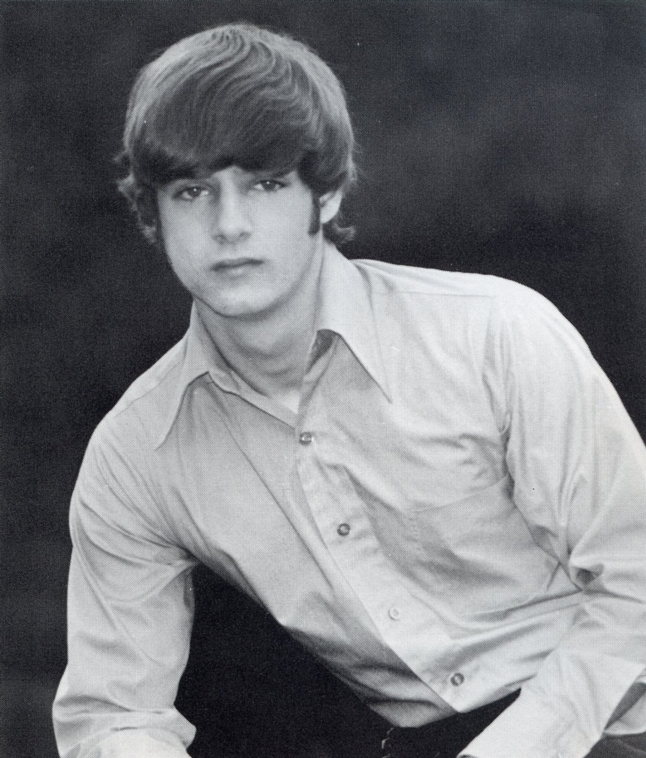 John in 1973 (senior photo) and later in life. John J. Kelly, 61, of Merrimack, NH, passed away on Friday, Aug. 19, 2016, following a lengthy illness. He passed at his home, just as he wished. He was born on Mar. 27, 1955 in Springfield, MA to the late Thomas and Ramona (Ingraham) Kelly. Befpre retiring, he worked as a commercial fisherman for Robert Francis Fishing. 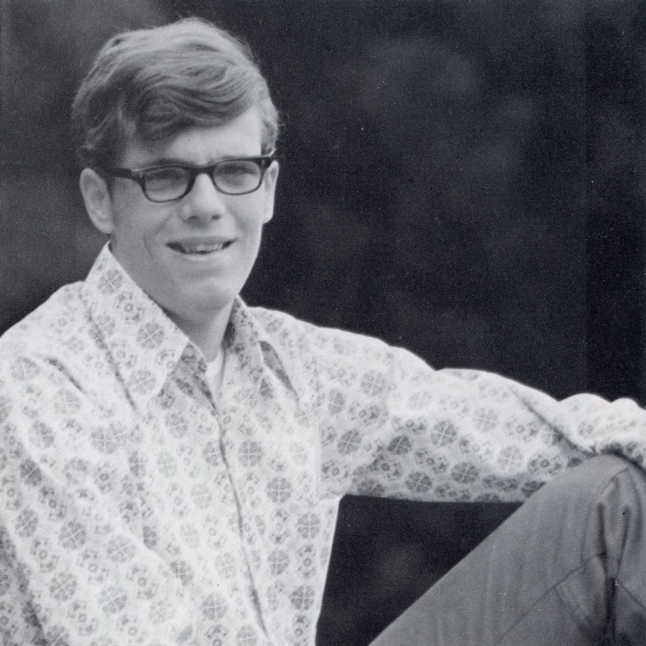 Along with his parents, he was predeceased by a sister, Deirdre Nelligan, and a stepbrother, Thomas Gallagher. John is survived by his sister, Deborah Lyons and her husband, Ronald; a nephew, Robert Lyons; two nieces, Jacqueline and Meredith Lyons; ex-wife and best friend, Joanne Diaz; former stepdaughter, Jessica Anderson and her fiancé, Cory Wharton; seven grandchildren, Travis, Emilia, Izaiah, Patrick, Madeline, William, and McKenzie; two step brothers, Francis and Peter Gallagher; four stepsisters, Lorretta Forsythe, Sheila Lilly, Diane Biscaldi, and Brenda Galluci; along with several close friends, Charlotte Thomas, Thomas Lunt, and Bill W.
Brian Michael O'Connor, 60, of East Longmeadow, passed away on Wednesday, Apr. 6, 2016 at Mercy Medical Center. 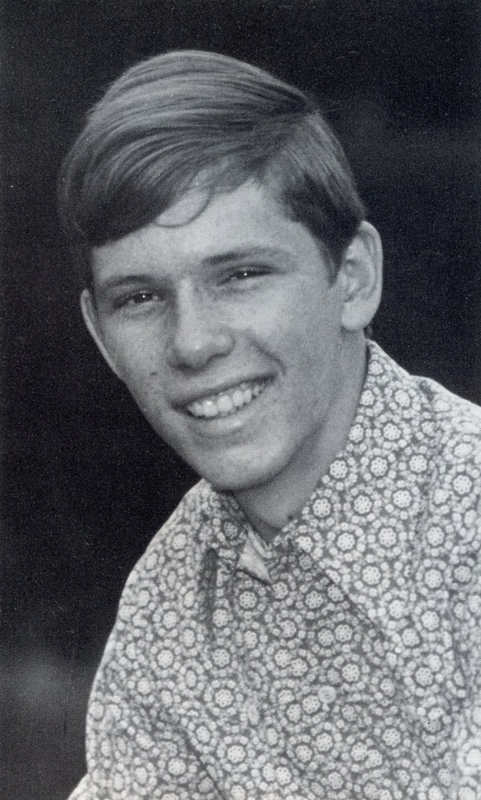 Born in Springfield on May 16, 1955, he was the son of the late Dennis J. and Angela (Rivers) O'Connor. Brian was a true outdoorsman. He lived for the hunting and fishing seasons and could often be found in camouflage in the woods with his friends. A jack of all trades, Brian could fix anything with an engine, especially cars and boats. He was a gifted tradesman, and could build, repair, or renovate anything that was asked of him. More than his talents was how he chose to use them, helping any friend or stranger who asked for his assistance. He gave of himself and was a loyal friend to so many, who will truly miss him. He leaves to cherish his memory his three siblings, Dennis J. O'Connor of East Longmeadow, Erin Lynch and her husband, James of Bedford, NH, and Kara Caillouette and her husband, Wayne of Longmeadow. He loved more than anything his three nieces and one nephew, Alanna, Emma, Hannah, and Samuel. Brian also leaves a special cousin, Rosemary Stella. Memorial donations may be made to The Nature Conservancy in Massachusetts, Membership Dept., PO Box 6016, Albert Lea, MN 56007-9987. Joanne in her junior year and later in life. Joanne L. Wheeler, 59, of Tahanto St., Concord, NH, died Monday, Dec. 29, 2014 at CRVNA Hospice House, peacefully surrounded by her beloved family. She was born in Springfield, MA, the daughter of the late Thomas A. and Eileen T. (Whitaker) Williams. Most recently, Joanne worked as a Licensed Nursing Assistant for Concord Hospital. Everyone Joanne met she made feel loved. To her, each person was a best friend in their own special way. She was a fabulous cook and caretaker of many. She loved being outdoors, camping in her Honda Element, kayaking, fishing, and hiking. She lived by her favorite motto: "It's not the destination, it's the journey." Joanne is survived by her two daughters, Beth Ann Wheeler and Karen Wheeler of Concord; a grandson, Tyler Wheeler of Concord; her five sisters, Fran St. Hill of Feeding Hills, MA; Eleanor Stevens of North Billerica, MA; Barbara Darnell of Provo, UT; Linda Shepherd of Newport, NH; and Nancy Williams of Westfield, MA; many nieces and nephews; her close friend, Paul Winter and his daughter, Hannah; and her beloved cat, Mica. (Excerpted from The Concord Monitor newspaper, Concord, NH). Joanne's remains are interred in Soucook Cemetery, Concord, NH. 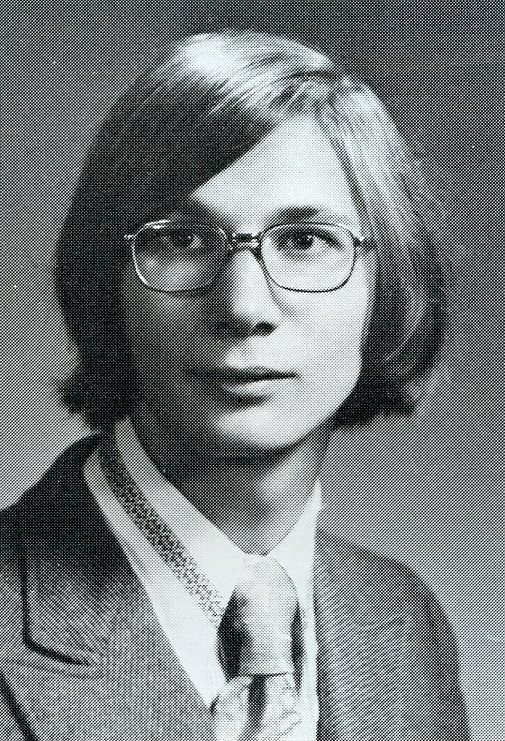 Larry in 1973 (senior photo) and later in life. 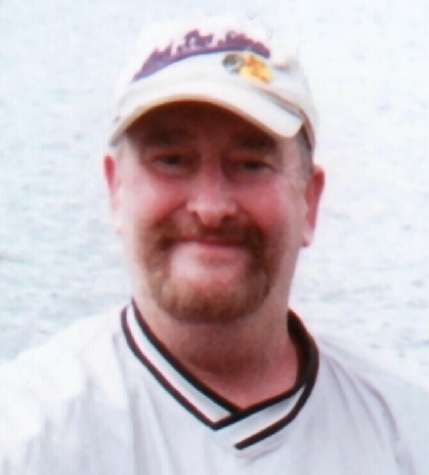 Laurent "Larry" Arthur Angers II, loving son, brother, uncle, nephew, and cousin, passed away unexpectedly on Wed., July 24, 2013 at his home in Ashfield, MA at the age of 58. Born in Springfield on Jan. 6, 1955, the dear son of Nancy J. (Johnson) Angers and the late Pierre A. Angers II, he resided in Ashfield for the past 30 years. Larrry graduated from East Longmeadow High School and attended Lyndon State College, which is located in the Northeast kingdom of Vermont. He was the head chef at the Lake House Restaurant in Ashfield for almost 20 years. Larry was a wonderful chef who loved to cook and truly enjoyed living on the pond in Ashfield, and in his younger years, he would spent much of his time fishing there. He loved the Red Sox and was also an avid fan of the Celtics, watching them on TV with friends whenever he could. One of the activities he most loved was skiing. It was a favorite family sport throughout the years, and he became a beautiful skier. Besides his mother, Nancy of East Longmeadow, he is survived by his loving sisters, Deborah Ellison and her husband, Kurt of Concord, NH, and Julie Stenning of Tiverton, RI; his aunt, Susan Kilburn of East Longmeadow; two nieces, Katherine Carigen and Emily Stenning, two nephews, Andrew Ellison and Christopher Stenning; and three cousins, Beth Kipetz, Jonathan Kilburn, and Nancy Celetano. 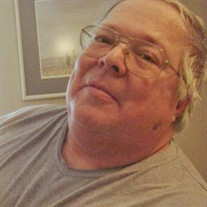 In lieu of flowers, donations in Larry's name may be made to the Double Edge Theatre, 948 Conway Rd., Ashfield, MA 01330. (Excerpted from The Recorder newspaper, Greenfield, MA). Richard "Rick" E. Weaver, 56, passed peacefully at home in East Longmeadow, surrounded by his loving family, on Saturday, Oct. 22, 2011. Born in Springfield, he was the son of Jacquelyn (Fenton) Weaver and the late Ewart Weaver. Rick was a 1973 graduate of East Longmeadow High School and an All-American in the 100 meter breast stroke, a record he held for 30 years. Rich earned his bachelor's degree in English at the University of Connecticut in 1977, where he placed 12th at Nationals in the 200 meter breast stroke. During his esteemed career, he worked at Connecticut Mutual Life, Hartford, Phoenix Reinsurance, Enfield, CT, and at Employees Reinsurance Corporation, Avon, CT. He spent the last seven years as the senior underwriting director at Lincoln Financial Insurance Company, Hartford, CT.
Rick was a member of the Association of Home Office Underwriters, where he served on the executive council. He also volunteered for the Academy of Life Underwriting, where he designed exam questions and developed curriculum. Rick was a member of Toast Masters, a swimmer, boat builder, and sailor. He loved flower gardening, and was such a wonderful story teller and writer. Above all, he was a devoted family man. He is survived by his loving wife of 33 years, Ruth (Brigham) Weaver; his three sons, Michael R. Weaver and his fiancée, Na-Young Kim of Northampton, John E. Weaver and his fiancé, Leah Gernux of Enfield, CT, and Ethan W. Weaver of East Longmeadow; his daughter, Jennifer Dubac and her husband, Mark of Portland, OR; his granddaughter, Allana Dubac; his mother, Jacquelyn Weaver of Hampden; his two sisters, Lori Lyons and her husband, Bill of Belchertown; and Judy Gonyeau and her husband, David of Monson. 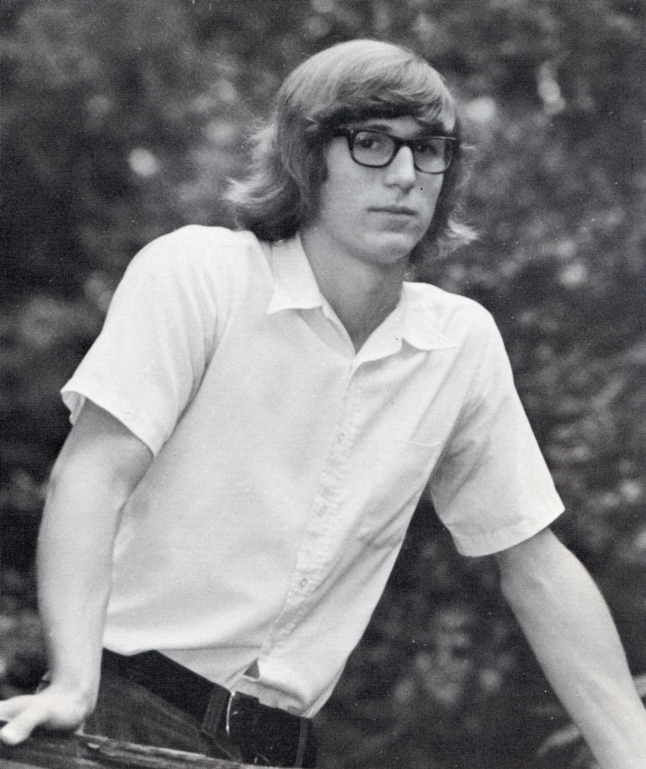 Bill in 1973 (senior photo) and later in life. 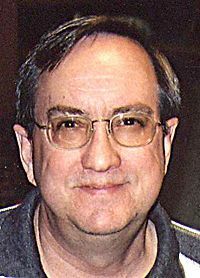 William "Bill" J. Reis, 55, of Wolcott, CT, passed away unexpectedly on Wednesday, Dec. 9, 2009 at Saint Mary's Hospital. He was the husband of Phyllis (Boyea) Reis. Bill was born Sep. 20, 1954 in Grand Rapids, MI, the son of Rose (Moreth) Reis and the late Allen Reis. He grew up in East Longmeadow, MA and attended Springfield Technical Community College, where he earned an associate's degree in engineering. He was the systems engineering manager of Conveyco Technologies in Bristol. Bill had resided in Wolcott for 24 years and was a member of the Wolcott Lions Club for six years. He was a volunteer with the Wolcott Boy Scouts Troop 231 for 10 years; a mentor/advisor for the Wolcott High School FIRST Robotics Team 1071 for seven years, and enjoyed golf. Bill could fix anything and was known to his family and friends as "Mr. Fix-It,"
Besides his wife of 29 years, Phyllis, and his mother of Enfield, he leaves his sons, Bryan of California and Jonathan of Wolcott; his daughter, Courtney of Wolcott; his brothers, Richard of Massachusetts and Robert of New York; his sisters, Rosanne Pelletier of Connecticut, Linda McGrady of Massachusetts, and Susan Tower of New Hampshire; 11 nieces and nephews; and three great-nieces and great-nephews. (Excerpted from The Republic-American, newspaper Waterbury, CT). Karen A. (Brown) Craven, 51, of East Longmeadow, died on Thursday, Sep. 14, 2006 at home surrounded by her loving family. She was born in Springfield on Jul. 7, 1955, a daughter of Dr. James P. Brown and the late Muriel A. (Ryan) Brown. 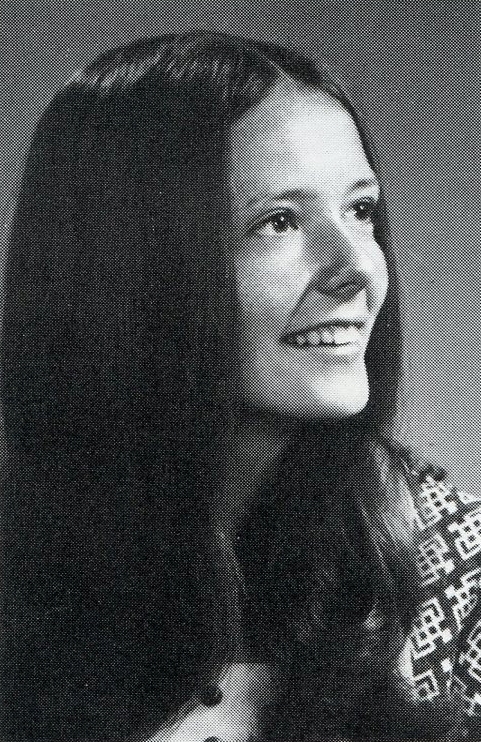 Karen was a 1973 graduate of East Longmeadow High School and had attended American International College in Springfield. She was employed in the Longmeadow school department for 17 years and most recently had worked as a secretary to the principal at the Glenbrook Middle School in Longmeadow. 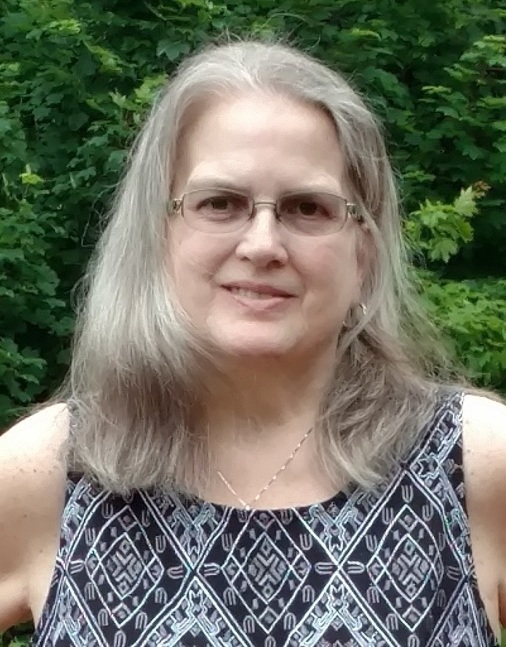 Karen was a communicant of St. Catherine of Siena Church in Springfield, and also served as a longtime Confraternity of Christian Doctrine teacher at St. Michael's Church in East Longmeadow. Karen leaves her husband of 27 years, Richard A. Craven, Sr.; her children, Richard A. Craven, Jr. and his wife, Elizabeth of Agawam, and Sarah Emily Craven of East Longmeadow; her granddaughter, Andersen E. Craven; her father and her stepmother, Dr. James P. Brown and his wife, Mary M. Brown of Longmeadow; her father-in-law, Albert B. Craven, Sr. and Gloria Craven of Tarpon Springs, FL; her sisters, Kathleen M. Day andher husband, Stephen of Oakland, ME, Maryellen Donohoe of Acton, MA, and Margaret L. Sullivan of Lowell, MA; her stepsisters, Christine Rybacki and her husband, Stephen of East Longmeadow, and Colleen Cunningham of Port Orange, FL; her many aunts, uncles, cousins, nieces, and nephews; and many friends, including her dear special friend, Stephanie Patsourakos of Acton, MA. In addition to her mother, Karen was predeceased by her brother, Kevin J. Brown, in 1983. Donations may be made in Karen's memory to the West Springfield Firefighters Relief Association, 44 Van Deene Ave., West Springfield, MA 01089, or to the Massachusetts Rehabilitation Commision District Office, 1 Federal St., Springfield, MA 01105. Karen's remains are interred in Gate of Heaven Cemetery, Springfield, MA. Peter S. Chipouras of Somers, CT, passed away Monday, Apr. 3, 2006. The cause was a car accident which happened while Peter was on business in Orlando, FL. He was 51. A master of finance, Peter's career began with his family's stone business. He continued his work helping to develop the first national quarries in Saudi Arabia. He went on to develop the first pizza shops in Saudi Arabia, Pizza Sheikh. 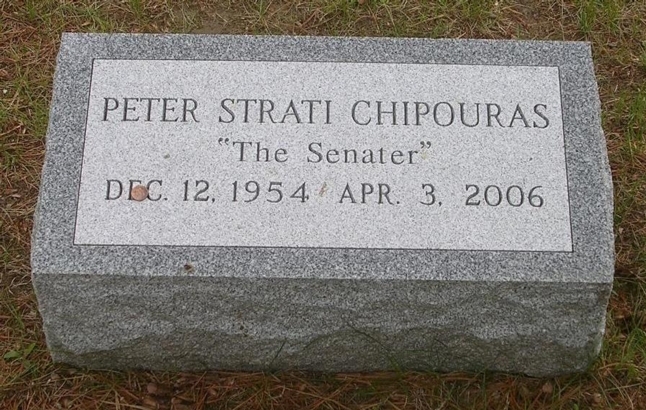 He was the cofounder of Sterling Capital Partners of East Windsor, CT.
Peter grew up in East Longmeadow, MA. He was a past president and Paul Harris Fellow of the Somers Rotary Club and served on the Somers zoning board. He was an expert skier, an optimistic golfer, a great cook, an enthusiastic gourmand, and a friend of Bill W's for 13 grateful years. Besides his best friend, wife, and love of his life, Anne, he is survived by his son, Christoper; daughters, Dana and Katie; his mom, Eileen Chipouras of Enfield, CT (formerly of East Longmeadow); his sister, Cathy Croall and husband, Tom; his brother, Jay Chipouras and wife, Laura; and sister, Ann Rice and husband, Stephen; many adoring nieces and nephews, and countless friends who loved him. 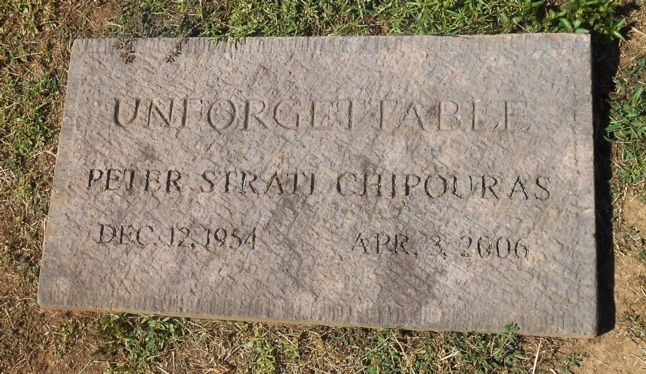 He was predeceased by his dad, Strati (Chip) Chipouras. Peter's family would appreciate contributions to the Wilson House, PO Box 46, East Dorset, VT 05253, or the American Diabetes Association Memorial Program, PO Box 1132, Fairfax, VA 22038. Peter's headstone in Center Cemetery, Somers, CT.
A second headstone for Peter in Evergreen Cemetery, Rutland, VT.
Kenneth during his freshman year. 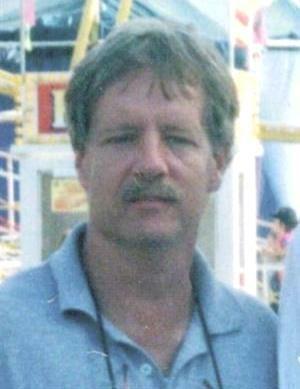 Kenneth M. O'Connor, 50, formerly of Springfield, passed away on Monday, Dec. 27, 2004. He leaves his three children, Christopher, Patrick, and Caitlin; his mother, Joan O'Connor of Delaware; and grandmother, Helene O'Connor of Springfield. He also leaves six brothers and sisters, Joanne Lupi, Mary Pagliaro, John and William O'Connor of Springfield, Patricia Dion of Hampden, and Kevin O'Connor of East Longmeadow. In lieu of flowers, donations may be made to the O'Connor Children Trust, Premier Source Credit Union, PO Box 2642, Springfield, MA 01101-2642. Barbara during her junior year. 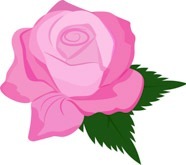 Barbara J. Boucher, 45, of 99 Middle St.., Southampton, died Sunday, Jul. 8, 2001 at Baystate Medical Center in Springfield. She was a saleswoman for Magic Moments Greeting Cards of Deer Park, Long Island, NY. 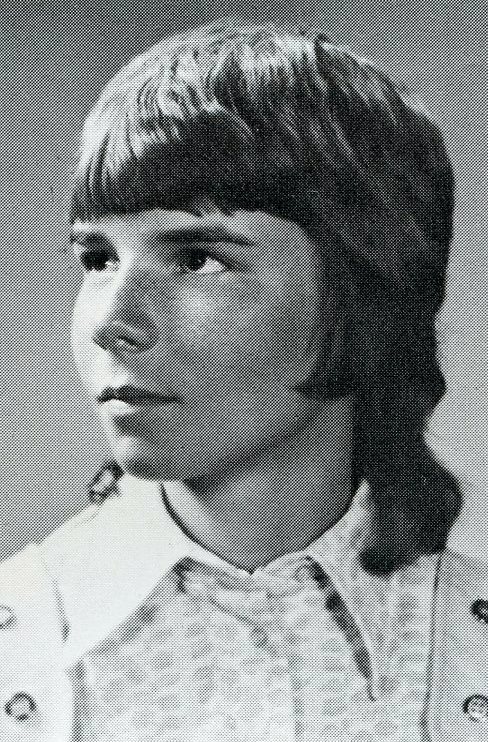 Born in Springfield, she lived in East Longmeadow for most of her life, before moving to Southampton 4 1/2 years ago. She leaves her mother, Lorraine M. Boucher of East Longmeadow, her fiancé, Ralph M. Donohue of Southampton; two brothers, Michael D. Boucher and Peter M. Boucher, both of East Longmeadow; and a sister, Christine B. Copping of Chester, VT.
Memorial contributions may be made to the Lupus Foundation of America, Connecticut Chapter, 97 South St., Suite 110, West Hartford, CT 06110-1960. 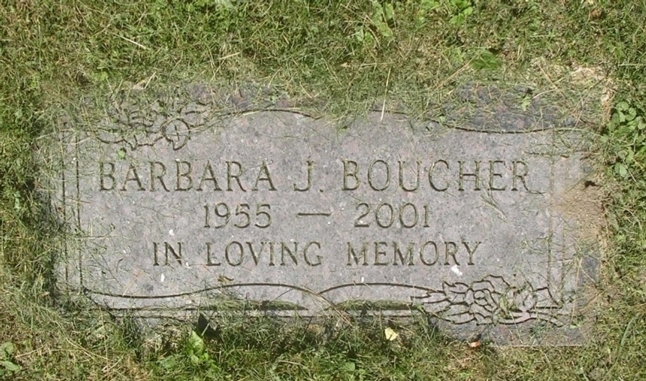 Barbara's headstone in Pleasant View Cemetery, Chester, VT.
Jean M. Ference-Burack, 44, of 157 Somers Rd., East Longmeadow, died Sunday, May 2, 1999 at Baystate Medical Center, Springfield. She was the co-owner of the Quarry Hill Llamas, property manger for B & B Enterprises, and owner and operator of The Gift Box Ceramic Studio. Born in Springfield, she was a longtime resident of East Longmeadow and involved in many community activities. She was a member of the First Congregational Church of East Longmeadow, past president of the Mountain View School PTO, and was involved in various llama associations. She leaves her husband, Daniel Burack; a son, David M. Ference; two stepsons, Jeffrey and Gregory Burack; her mother, Alyce (Regan) Phillips; a brother, Jeffrey Phillips; and two sisters, Judith Bowen and Janet Young, all of East Longmeadow. Memorial contributions may be made to the Douglas Burack Memorial Scholarship Fund, PO Box 414, East Longmeadow, MA 01028. 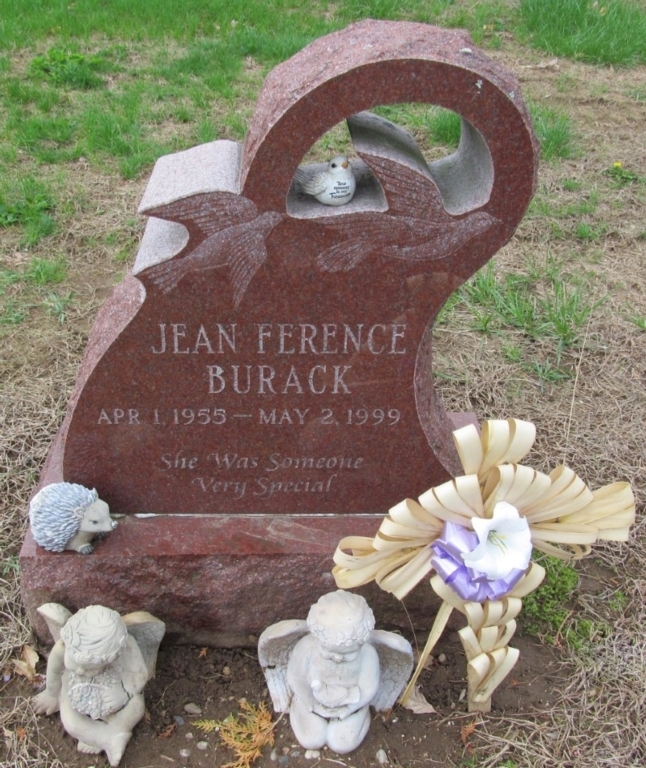 Jean's headstone in Greenlawn Cemetery, East Longmeadow, MA. The inscription at the bottom reads, "She Was Someone Very Special. James W. Branchini, 40, of 19 Grenada Terrace, Springfield, died Monday, Apr. 1, 1996 at home. He was a tile settler for Bachand Tile Co. in Amherst for 15 years, until 1992. He also worked at other local tile companies. Born in Springfield, he lived in East Longmeadow, and was a 1973 graduate of East Longmeadow High School. He moved to Springfield 12 years ago, and was a former member of the Adriatic Club. He leaves two sons, James R. and Vincent A. of Springfield; his mother, Ann (Nikel) Branchini of East Longmeadow; two brothers, Bruce Graham of Springfield and Robert R. Branchini of Slingerlands, NY; and a sister, Judith Langenfield of Vienna, VA.
Memorial contributions may be made to any charity. James' remains are interred in Gate of Heaven Cemetery, Springfield, MA. Michael C. Busekist, 38, of 64 Rochford Circle, Springfield, a consolidator at Lechmere's Department Store in Springfield, died on Thursday, Jan. 20, 1994. 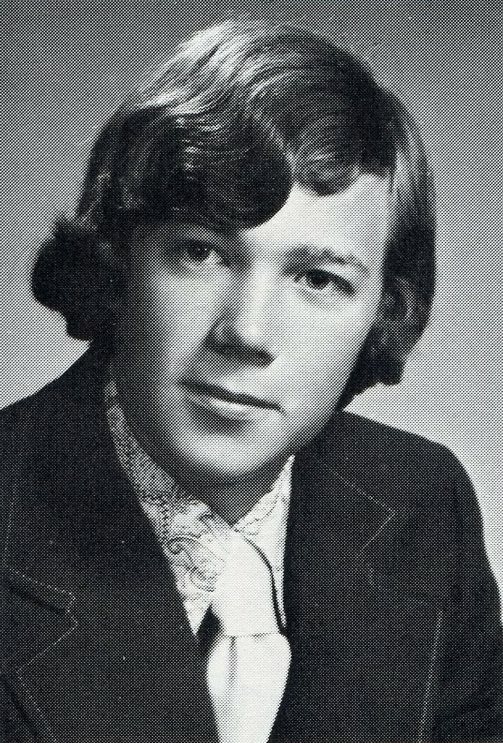 He worked previously at Standard Uniform Co.
Born in Cortland, NY, he lived in East Longmeadow, and was graduated from East Longmeadow High School in 1973. He received a degree in business management from Springfield Technical Community College in 1984 and moved here nine years ago. He was a member, Sunday school teacher, usher, and lay reader at Christ Church Cathedral. He leaves his wife, the former Kathleen Small; a daughter, Melissa Jean Busekist at home; his parents, Clifford and Elizabeth (Cunningham) Busekist of Palmer; three sisters, Linda Merlino of Enfield; Cheryl Harrington of Kingston, and Susan Cooley of San Diego; and several nieces and nephews. 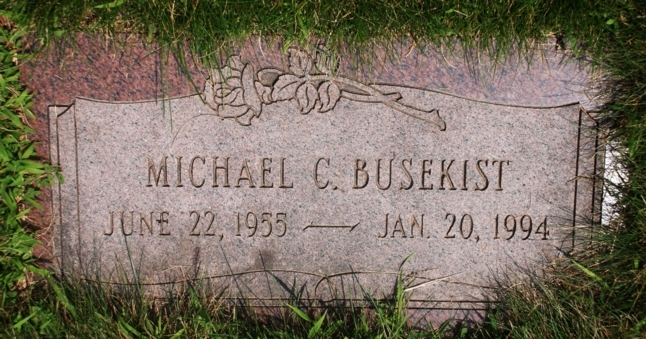 Memorial contributions may be made to the Michael Busekist Trust Fund, in care of Susan Steger at Springfield Institution for Savings, PO Box 3034, Springfield, MA 01102. Michael's headstone in Hillcrest Park Cemetery, Springfield, MA. A 20-year-old was killed Sunday, Nov. 2, 1975 in an auto accident in Chatham, Ontario, Canada. Cynthia J. Wade of 98 Barrie Rd. was a passenger in a card driven by Karen Eklund, 19, of Lynn, police said. The car was heading west on the 401 Highway in Kent County about 8 p.m., police said, when it jumped the median strip and collided with an eastbound vehicle. A second passenger in the car driven by Miss Eklund, Cheryl Carlson, 20, of South Easton, also died in the accident, police said. Miss Eklund was charged with careless driving, police said. Miss Wade was a sophomore nursing student at North Park College in Chicago. She was a graduate of East Longmeadow High School. She attended Holyoke Community College and Springfield Technical Community College. She was a Springfield Hospital volunteer and a ward clerk at Wesson Women's Hospital. She attended the Evangelical Covenant Church and was a choir member. She leaves her parents, Mrs. Katherine (Wyman) Webber of East Longmeadow and Edward Wade of Springfield; her stepfather, John S. Webber of East Longmeadow; four stepbrothers, David of Baltimore, MD, Herbert of Springfield, Stephen of Newport, RI, and John Webber of San Pedro, CA; and a sister, Linda Jacque of Northampton. Memorial contributions may be made to the East Longmeadow scholarship fund or the North Park College scholarship fund, Chicago, in memory of Cynthia Wade. Cynthia's remains are interred in Hillcrest Park Cemetery, Springfield, MA.